Disclaimer: Dragon Age: Inquisition and all it's characters are the intellectual property of Bioware/EA. I watch her from the ramparts, unable or unwilling to keep a smile from my face. Mira strides through the courtyard below, her gait assured and her bearing one of authority, as always. Today, however, she's leaving smothered laughter and smiles in her wake. Traveling behind her, trying very hard to behave, is Da'len, the Mabari pup I gave to her last week. You'd expect a Mabari, even a puppy, to strut as she walked. With all that muscle, all that grace, that every step taken would be a reminder of just how quickly your throat could be ripped out. Not so. At least, not with Da'len. Disclaimer: All recognizable content belongs to Bioware. Today is the end of the world. 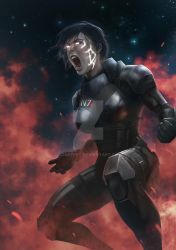 Or, rather, it was the end of Commander Adriana Shepard’s world. She awoke to the shocking realization that the only person she ever truly loved in her life, was dead. Thane always said that she awoke him from a slumber, but it was her who had felt awoken when she met Thane. He gave her the confidence and will to continue fighting--whether the enemy was the Collectors or the Reapers--and she did not know what to do.